Back in 2007, TAXI—an ad agency lauded for its work for WestJet, Telus and Koodoo Mobile—celebrated 15 years of success. Rather than have a birthday bash or run ads in trade journals extolling their virtues, they did something remarkable – they gave birth to a really cool idea – one which I hope inspires companies both large and small to contribute to the greater good. To mark the occasion, they wanted a big idea, one that would give back to the community. The brief was sent out, and executive creative director, Steve Mykolyn, came back with The 15 Below Project. Its first initiative – a jacket for the homeless. The jacket would be breathable, waterproof, lightweight, and the lining would be made up of pockets throughout. 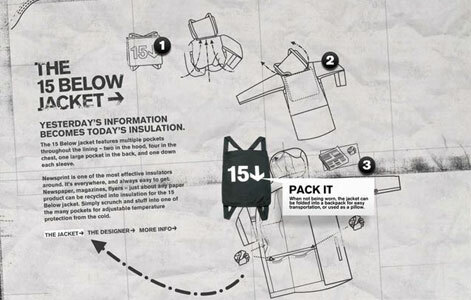 And these pockets would be able to be stuffed with newspaper to provide adjustable levels of insulation from the cold. “We’ve survived 15 years, now we’re going to help others survive the night,” said Mykolyn, who enlisted long-time friend and designer, Lida Baday, to create the jacket. Adding weight to the 15 – year theme, as well as lending the project a name, is the Cold Weather Alert many cities issue when the temperature drops to -15ºC. On behalf of clients and staff, three thousand 15 Below jackets have been donated to people living on the streets throughout Canada and the U.S.